By Andre Leu, Well Being Journal, Vol. 24, No. 4. The information from USPCP shows that current regulatory systems have failed to protect unborn and growing children from exposure to a massive cocktail of toxic pesticides. This has many serious implications, especially the increase in a range of serious health issues in both children and adults. Scientific research shows that many pesticides affect the normal development of the nervous system in fetuses and children. The brain contains the largest collection of nerve cells, and there are several scientific studies showing that when the fetus and the newborn are exposed to minute amounts of these pesticides, below the current limits set by regulatory authorities, they can significantly alter brain function. Researchers at Duke University Medical Center found that the developing fetus and the newborn are particularly vulnerable to amounts of pesticides lower than the levels currently permitted by regulatory authorities around the world. Their studies show that the fetus and the newborn possess lower concentrations of protective serum proteins than adults. A major consequence is developmental neurotoxicity, where the poison damages the developing nervous system. This damage interferes with the normal development of the brain and other parts of the nervous system, such as auditory nerves, optic nerves, and the autonomous nervous system, resulting in lower IQs, ADHD, autism spectrum disorders, lack of physical coordination, anger management issues, bipolar and schizophrenia spectrum disorders, and depression, as well as problems with eyesight and hearing. This means that contact with chemicals at levels well below the current permitted residue quantities in food can harm the fetus and the breast-feeding child, even if the mother shows no side effects from the contact. 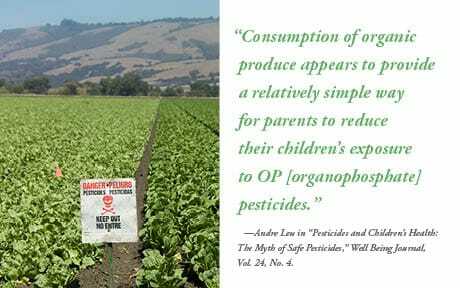 Eating food with pesticide residues can harm young children, as they are still developing their nervous systems. To continue reading, see Vol. 24, No. 4, July/August 2015 (available in print or digital format).